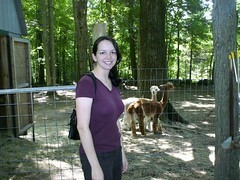 A couple weeks ago, my mother surprised me with a trip to see alpacas! 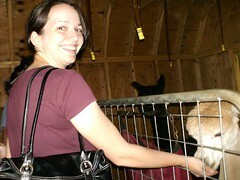 We were visiting her and her boyfriend and she suggested we drop by her friend’s budding fiber farm to check out her alpacas. My face lit up! Did she say alpacas? She didn’t have to twist my arm. 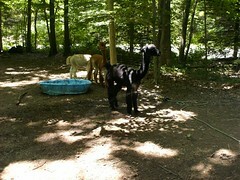 We arrived at Debbie and Tom’s (unannounced, mind you) and they were more than happy show us there three alpacas. They were recently sheered in preparation for the warm summer weather so they weren’t super fluffy, but they were still cute. If I remember correctly they’re all males and one is brown, one is off-white, and one is black and she’s keeping them mainly for the fiber business. Much to my surprise many people don’t keep alpacas for that reason, they’re in it for the breeding which can be quite profitable. Then after giving me the low down on the alpacas she let me fondle some of the alpaca fiber she spun. Alpaca is soo soft. Why, oh why, do I knit with acrylic! 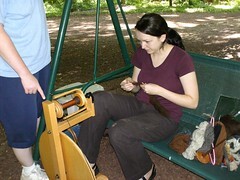 THEN, she whipped out her drop spindle and demonstrated how you spin with that. 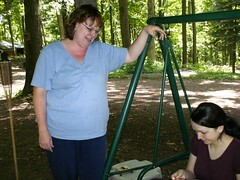 THEN, she whipped out her spinning wheel and gave me a crash course on spinning and plying. Needless to say this lady is AWESOME! Once she gets things up and running with the business I will share her contact info for anyone who is interested in some alpaca roving. Soon, I shall invest in a drop spindle of my very own and maybe someday in the future some alpacas of my very own. But that will be in distant future since my apartment doesn’t even allow cats. Again, I can’t tell you how incredibly nice and welcoming Debbie and Tom were. She was a great teacher. You can tell she’s had lots of practice from her spinning demos. 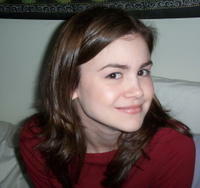 Thanks to my Mom for remembering to bring a camera (not to mention taking me to her friends house). mwah. YAY!!!! Was that your first time spinning? It looks like you're concentrating really hard! By the way, do you still live in CNY? I'm moving back there in a couple of weeks, maybe we could get together for some stitching and bitching!